Matt Monro became employed as a driver- among other things- after his discharge from the army, but sought work as a part-time singer wherever he could. This included making advertising jingles for TV commercials. He was given his first real break as a singer on Cyril Stapleton's 'BBC Showband' radio programme and through this eventually secured a contract to record, but his output received little attention. He had developed a reputation for a singing voice that was frequently compared to Frank Sinatra, and although this was overstated it did lead to attention from EMI. Future Beatles' producer George Martin was looking for a suitable singer to use as a 'spoof' Sinatra on a forthcoming comedy recording of Peter Sellers. This was with Parlophone which was a label that EMI used for its comedy output during the late 1950s, but was also now signing, more serious artists- indeed it would shortly include the Beatles on its roster. Monro's singing voice thus appears on the famous goon's 'Songs For Swingin' Sellers'. The EP shown here (GEP8898) had Matt airing some new songs for the potential UK entry to the Eurovision song contest. It wasn't Matt's or the UK's year, but the EP proved a popular purchase and saw Matt at the pinnacle of his 1960s recording career. Matt's first release on the new label didn't do much better than his previous efforts, however the next two both made the top ten and the guys at Decca and Fontana must have wondered where they went wrong. At a time when younger record buyers were turning to beat groups, Matt had to work hard for his hits. However, they did come and his rendition of the Lionel Bart penned 'From Russia With Love'- from the Bond movie of the same name- also gave his international status a boost. By the end of the 1960s Matt's singles career seemed just about over, but he managed one further hit during 1973 with 'And You Smiled'. Despite the lack of a market for his singles, Matt continued to be popular with his albums and TV work through the 1970s. He also worked the nightclub scene and had done well enough with his records in the USA to do so there as well as in the UK. 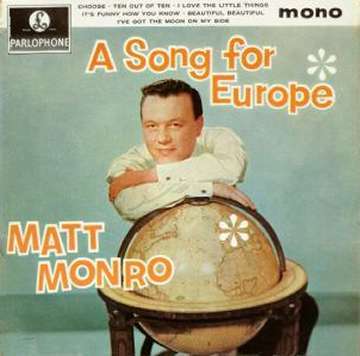 Sadly, Matt Monro died from cancer during 1985, thus robbing Britain of one of its most revered performers.